As I write this, I’m at LaGuardia Airport in New York, waiting for a flight to take off. I have one of those quick day trip work meetings, out at 5am and back at 9pm. Although it’s a long day, I have always enjoyed trips like these. In my first job, I barely ever traveled. In my second job, all I did was travel. With that second job, I did plenty of quick trips all over the country. I traveled all around the world, too – England, Belgium, even Africa. Of course, while I prefer to fly at normal hours of the day (ie 9am-5pm), I’ve always kind of enjoyed the “rat race” at the airports. There’s something invigorating about seeing everyone racing around, making flights, rushing off to meetings, finishing work on laptops and closing deals on the phone, while making through security. However, after over a year of traveling every week, it was a breath of fresh air when I quit that job and started Inspiralized. I can’t help it! I want to be comfortable while I cook – that uniform usually consists of spandex and a cruddy t-shirt I don’t mind spilling oil on or staining with beet juice. When I do run errands, though, I put a little effort in – I’ll put on some mascara, wear jeans and maybe, just maybe – I’ll blow dry my hair. Anyway, while I do miss certain things about working in “corporate America,” I wouldn’t trade in what I’m doing now for any job in the world – I’ve found my happy place and I’m here to stay. So today’s recipe is made obviously with jicama. I was looking through my Recipes index the other day and I realized that I only had one jicama recipe (I have more jicama recipes in the cookbook than the blog!) – so I had to change that. Jicama is typically found as a garnish, thrown atop a bed of greens or used as a cole slaw – it’s very popular in Mexican cuisine. Jicama is one of those very underrated veggies, I think – it’s got a nice, crisp flavor and it’s low in calories. 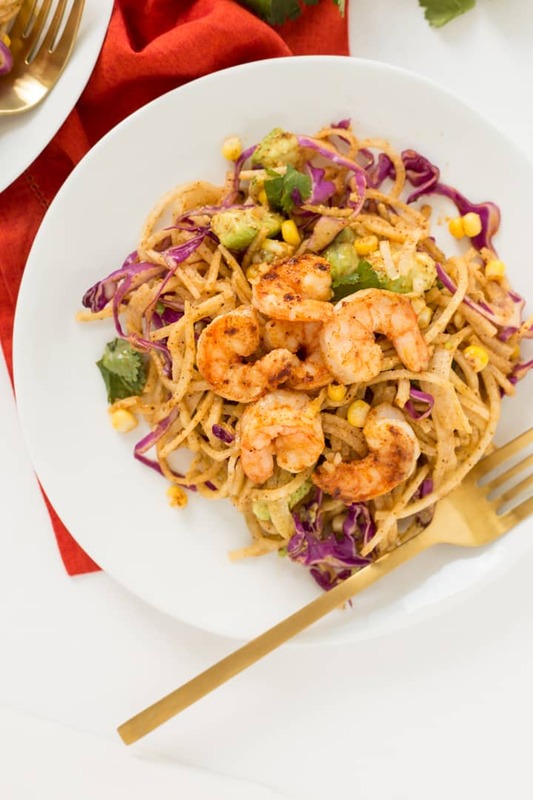 It takes on any seasonings you add very well and it’s crunchy – perfect for summertime slaws and light weeknight meals. This simple lime dressing with cilantro is all you need with the jicama – it freshens everything up, gives a bit of tang and works nicely with the chili powder and creaminess of the avocado and sweetness of the corn. 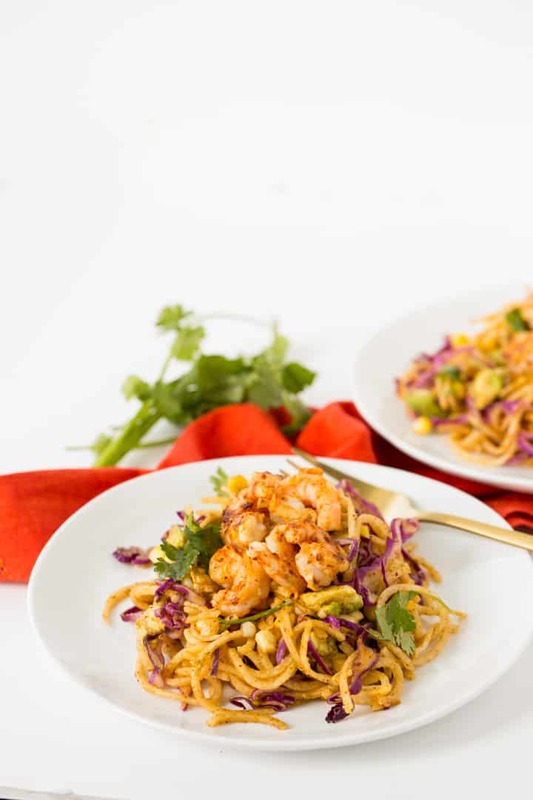 The shrimp is the “cherry on top” – the rich flavors of the paprika and garlic powder seasoning shines with every bite and offers a filling but lean protein. Alright, they just announced that my flight is boarding. Wish me safe travels! In just a short 14 hours, I’ll be back in my apartment, chilling in my jammies again. 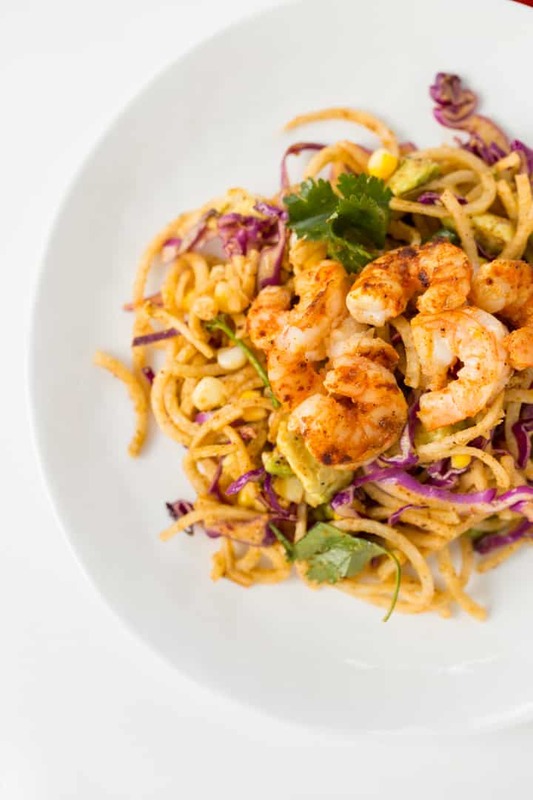 Have you spiralized a jicama yet? Place an ear of corn into a medium pot and cover with water. Bring to a boil, cook for 2 minutes or until corn is fork-tender and then drain into a colander and set aside. Meanwhile, place a large skillet over medium-high heat and add the olive oil. Once oil heats, add in the shrimp and season with salt, pepper and garlic powder. Cook for 2 minutes and flip over, cooking another 1-2 minutes or until shrimp is opaque. Transfer shrimp to a plate. 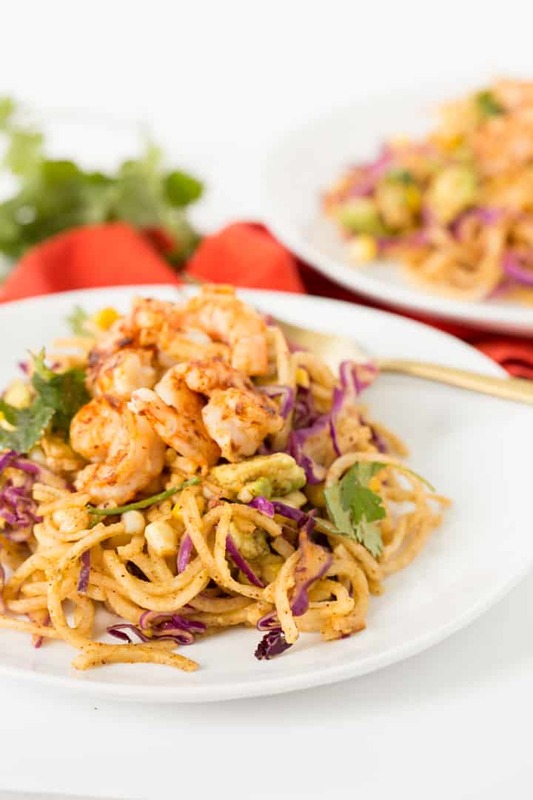 In the large mixing bowl, toss together the corn (shave the kernels off the cob with a knife), jicama, chili powder, avocado, cabbage and cilantro. Pour over the dressing and toss thoroughly to combine. Divide into bowls and top with shrimp. I have spiralized a jicama, but both times with my paderno's blade C it ended up being a mess, with more mush than noodle, jamming up the blade. Now that I have an inspiralizer(yay! ), maybe it will be better...also maybe I was pushing too hard?? 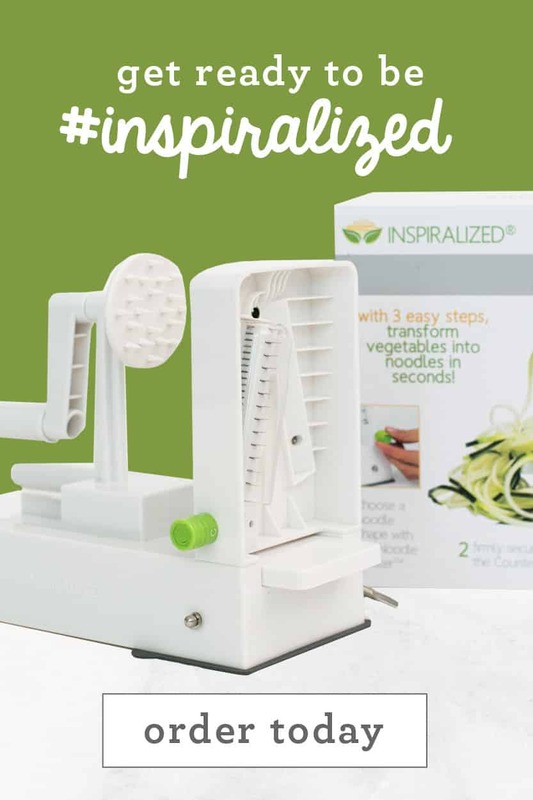 Oh, you're in luck - you're going to be amazed by how well the Inspiralizer spiralizes jicama - with all blades (I like Blade C on the Inspiralizer also- almost used that for this recipe.) Have fun! Love this idea! It looks fresh and light! I enjoyed reading your post as well, and I am in a similar situation to your previous job. I travel frequently for work and spend some time working from my home office as well. 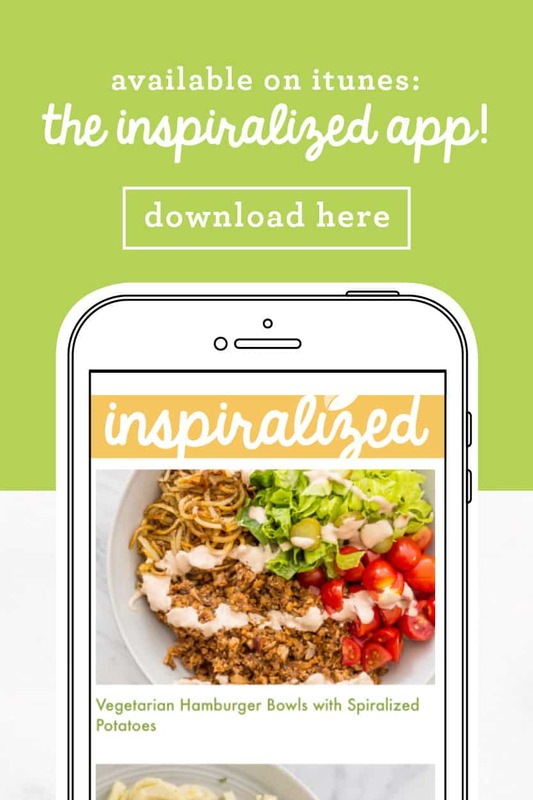 I would LOVE to read tips on how to eat Inspiralized and healthily while travelling or packing lunches for work and for travel. Thanks for all that you do, Ali! 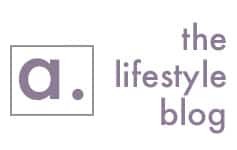 It is a pleasure to read your blog and use your recipes! What a great suggestion! I will work on a post about that, thank you! 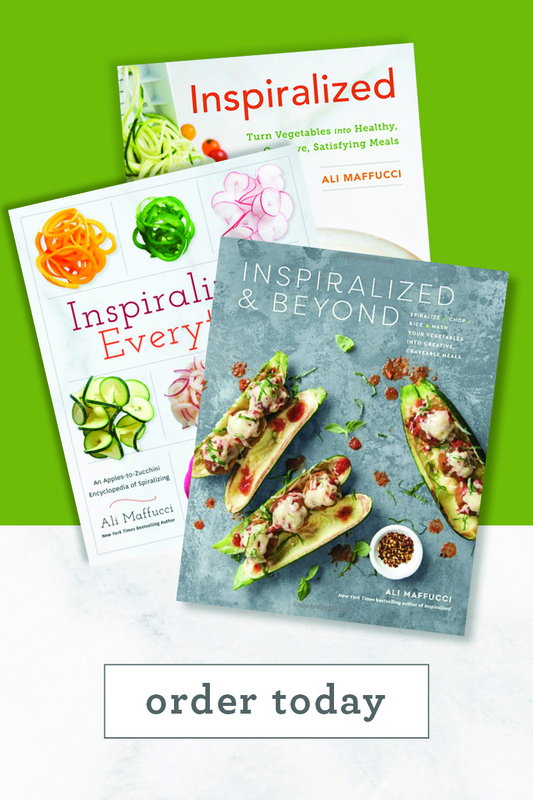 Thank you - you can try kohlrabi or zucchini! THANKS ! Basil is a great choice... love it ! Looking forward to low carb, one pot entree/meals/main courses. How much corn do you typically get off of one ear of corn? I just buy it frozen because I think that's easier - is it like a 1/2 cup or 1 cup? DO you think, you could do this recipe with another vegetable? Of course! You can use zucchini or kohlrabi, that would be nice! This recipe sounds fantastic. I have not yet spiralized jicama, even though I eat jicama with some regularity. Definitely want to try that. I would have to sub chicken for the shrimp to make my husband happy. And leave the avocado out of his. Would definitely like to make this. This looks incredible!! I've never had jicama before. Definitely have to gibe this a try! I added scallions, mango, and edamame....YUM! Thanks for a great recipe! Love this recipe. Fixed it last night. Jicama does get mushy. 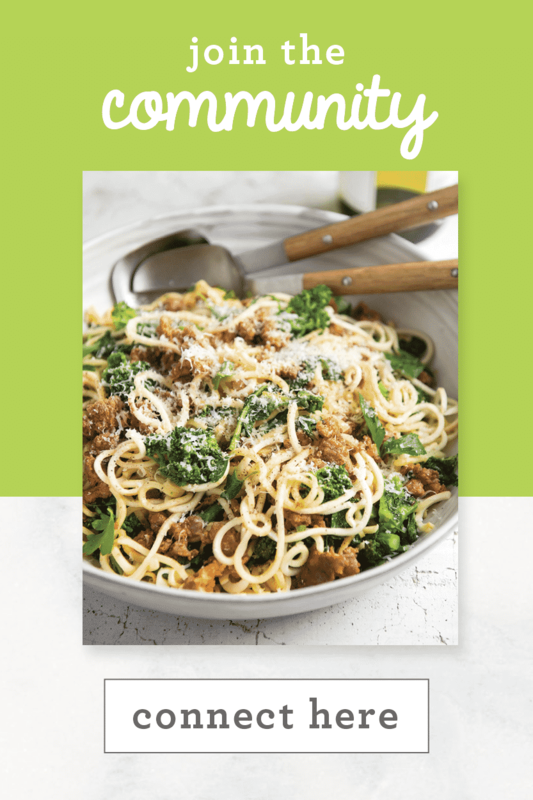 Think trick might be to spiralize smaller pieces.Thank you for all your wonderful recipes. I am sooo addicted to spiralizing. I tried it and FAILED. 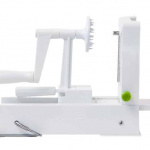 Couldn't get the spiralizer interested in the jicama at all, it just wore through on the non-blade side and, although I kept cutting off the chewed up part and trying again, it just wouldn't work. Maybe I had an unripe jicama? Or I should have cut it into smaller pieces? I've had no trouble with jicama. I did cut both ends off after peeling to create a good flat surface to attach to the prongs and for a smooth cutting surface for the blade to catch hold of. And do be careful not to push too hard. 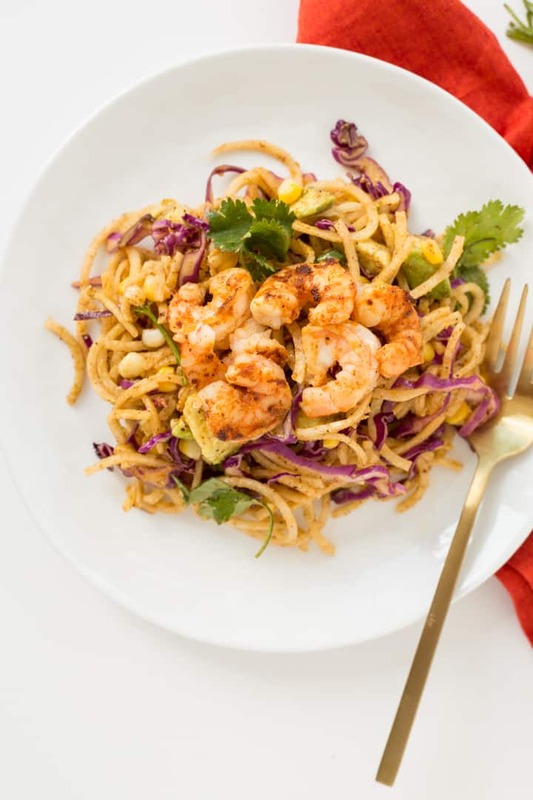 Don't give up, because it turns out jicama is GREAT spiralized! 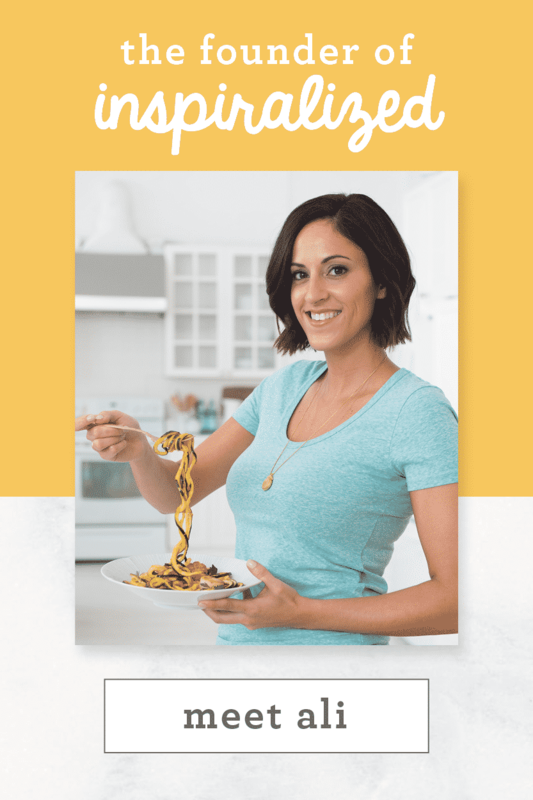 Maybe my spiralizer is getting dull? Do you have one of Ali's new Inspiralizer machines, or the older Paderno model? If the older model, and you use it a lot, I suppose that could be the case. 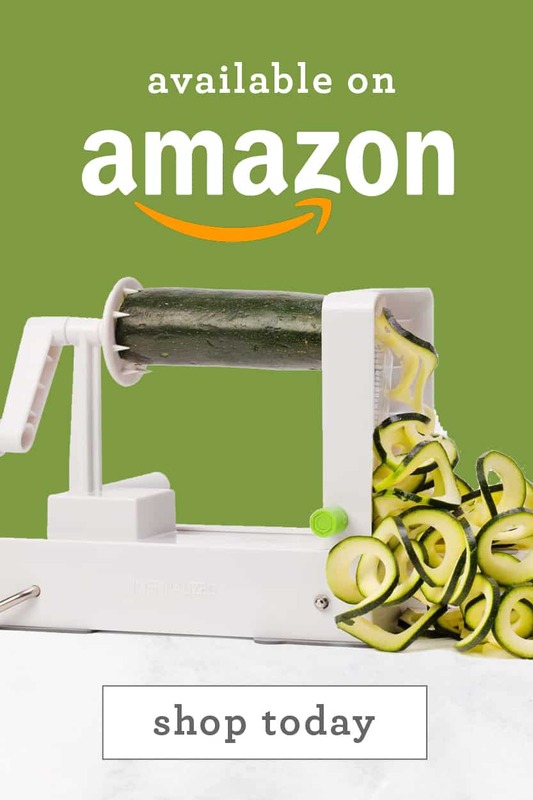 The new Inspiralizer hasn't been out long enough to get dull, unless you're spiralizing concrete! I think your idea that maybe the jicama isn't ripe could be the problem. How can you tell? I never bought one before I saw this recipe! I made this today. Love the seasoning on the shrimp and the crunch of the veggies. I made this tonight. I liked it, but I think next time I'll only make half the dressing as it was a bit overpowering. I love jicama, so I'm always looking for more recipes with it! Thanks! THIS WAS DELICIOUS! My first Inspiralized recipe and I'm sold! I wasn't sure what to except, but the dinner was filling, refreshing, and delicious. Husband loved it too. Excellent job, Ali!